OK, here is the list of PD gigs as it stands. This is Jeff's original list with a few amendments and additions that have been made from reliable and/or verifiable sources and with a few dates removed until we can get confirmation. If anyone has any dates to add or any info that can help improve the accuracy of the list, please feel free to comment. Your input will be very welcome. Here are the first lot of TBC's from the master list. Haven't been able to verify these, so any help anyone can give would be much appreciated. Many thanks. These are all perfectly possible, as they run up to the London Clarendon date on 8th Dec. The Leicester gig has been discussed before, and a bootleg recording exists allegedly from that day but no definite evidence could be discovered. A fan over on the Play Dead Appreciation Society Facebook page claims this gig happened in October 1984, as Ian Astbury and Billy Duffy from The Cult appeared onstage with PD after their own gig at the Markthalle. However, the online gigography for The Cult does not list a Hamburg gig during this month, it is listed as 16th June 1984- and at this time PD were touring the UK, in fact 16th June was the date of the infamous Tin Can gig. However, The Cult were touring in Northern Europe during October 1984 (the same month that PD were) so maybe someone's memories have become mixed up. This may be a massive act of imagination but I'm convinced that this gig happened. This would have been part of the same short tour that featured the Croydon Underground gig and the Rock City headliner. Owens Park was part of Manchester University but was a little further out of town than the central campus. Rose Of Avalanche supported. Please tell me that I'm not going mad. Proof that the Manchester gig happened and I'm therefore not losing my mind has come courtesy of archive ace David Manlove. See below. Many thanks to David for allowing us to use any item from his collection. This gig has now been added to the list. After flicking through old copies of the music papers in the British Library today, the Melody Maker gig listings for December 1983 does indeed list these three gigs (as well as others) as happening between the 2nd - 10th. The Leicester gig is stated as happening at the Psychic Club rather than Sound Scan Studios though. These have now been added to the list. Details of some early London gigs added as well as support slots with Wasted Youth, Theatre of Hate & 23 Skidoo in 1982. Just found CDs of these- 1983: Live - July 28, 1983 Hull, Dingwalls / Live October 13, 1983 Hammersmith, Klub Foot. The second is listed as "London Clarendon". Looks like Klub Foot was a weekly "happening" at the Clarendon Ballroom? binklebracket3 wrote: Just found CDs of these- 1983: Live - July 28, 1983 Hull, Dingwalls / Live October 13, 1983 Hammersmith, Klub Foot. Are these the same recordings that we have listed on the audio archive page? These are downloadable as MP3s so please check them out and let us know. If not, it would be good to hear them. 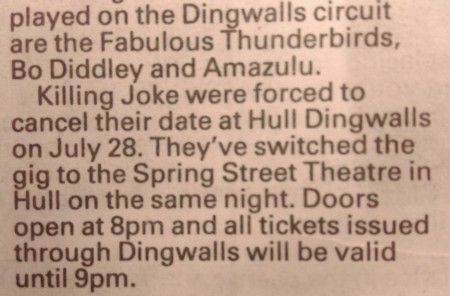 I also wonder if this 'Dingwalls' gig is becoming confused with the Killing Joke support slot that happened on June 28th 1983 at the Spring Street Theatre in Hull? In fact there is also a recording listed as being made in Durham on 23rd July 1983, when the Killing Joke/Play Dead gig happened in Durham on 23rd June...I wonder if both dates of these are incorrect? It would be too much of a coincidence that Play Dead made return visits to both these cities exactly one month later surely? I will go do more research and get back to you, standby. Regarding the Klub Foot. I do believe you are right, it was either a weekly 'happening' or some kind of ongoing series of events. OK. After consulting back copies of the music press in the archives at the very wonderful British Library, it seems that the Killing Joke tour did take place in July '83 and not June (see below). The original info about these dates came from the gig list at the official Killing Joke website (which is currently undergoing redevelopment so I can't provide a link at the moment) so we can perhaps be forgiven for thinking that was a reliable source. I have now amended the list at the top of this thread accordingly. In regard to the Dingwalls issue, a news report in the music press in mid July 1983 stated that the Dingwalls chain had found itself in financial trouble and that the Hull and Sheffield branches of Dingwalls had already closed. This report also contained a mention of the Killing Joke gig in Hull and the change of venue (see below). So, all mentions of a Play Dead gig at Hull Dingwalls on July 28th are false. The actual gig took place at Hull Spring Street Theatre and was as support to Killing Joke. A very good gig it was too, I remember it well. It would also seem that the earlier advertised Newcastle Dingwalls KJ gig was switched to Durham University, presumably because of the closure of the Newcastle venue. Glad that is all cleared up now! They made a gig in La Mèche Bleue near Saint-Brieuc (France) but i don't know when. tomcurren wrote: They made a gig in La Mèche Bleue near Saint-Brieuc (France) but i don't know when. Hi Tom. 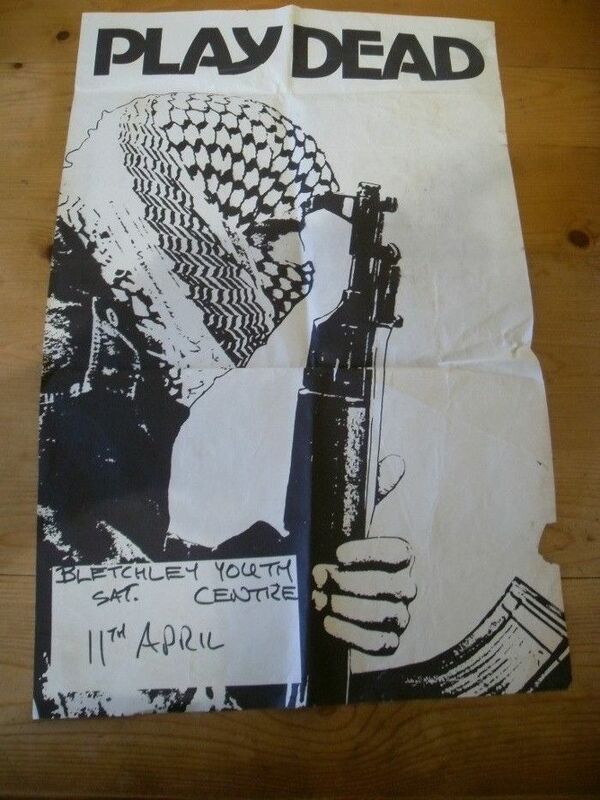 Did you attend this gig? Can you remember anything about it? Unfortunately i wasn't there. Too Young. I'm trying to get some informations. I just know the concert was good. It was a club located in L'Hermitage Lorge, a small village beside a forest. It lasted 4 years and all local bands played there, most of them coming from Rennes, the french rock/new wave capital from 1979 till late eighties. Dead Can Dance played their first album there too. I have found the DJ on Facebook and asked him the same question. When i get his answer, i will post it here. Next week, I will see Peter and the Test-Tube Babies playing not far from this club and will try to pick up some news. Unfortunately, not. I've just seen the old club which is a slum actually. I was occupied with my work too. But i'm talking to the former DJ and he told me the concert was fantastic because they were efficient to control the sound balance. They spend a good time because Play Dead members were friendly. I will perhaps get few informations because i've picked up few contacts of people used to spend nights in that place. I've sent questions to a journalist and waiting for his answer.